Aug 30 - relaxing in Bangkok, alone. The pictures below are thumbnails, meaning they are small copies of the real thing. You just click them. The weather in Norway and in Bangkok just now. 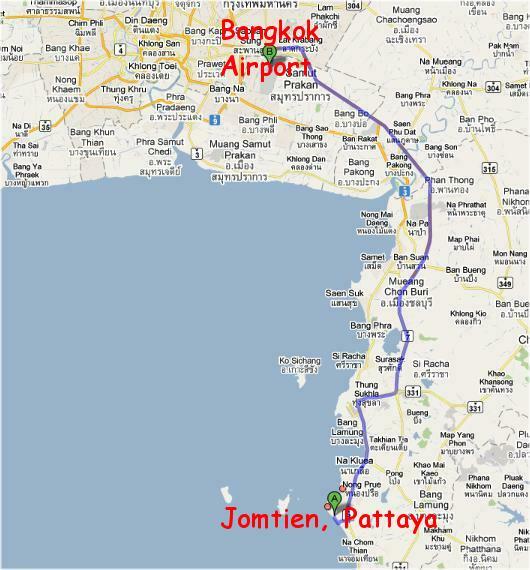 Map of lovely Thailand and Jomtien. Martin started his day with his 3000 meters and med a nice American, Paul in the pool. Since the signal is weak and the connection is unstable, Martin has to go outside his room to get his PC to work properly. Martin just outside his room, updating this blog, reading emails and Norwegians newspapers. Martin's lovely boss maid that looks after Martin. Her name is Aree and she found Martin's Norwegian cell that he forgot in his room 363. Off to hunt for English book for Pin. View from Nana Sky Train station. One of the fancy buildings of downtown Bangkok. In the supermarket, Big C, Martin was hunting for Pin's book. 5 bookstores yesterday and 2 today, No luck. Happy Tuc-Tuc driver in Bangkok. Tried to sell Martin anything from fur to hookers. The busy streets of Bangkok. Martin had a beer while a man was setting up his street shop. Back at the hotel, time for some massage and relief from this voluptuous woman Lucy. She was gooooooooooood. The next day, Friday August 31st, it was time to go to Jomtien and Martin's condo. August 31, 2012 at 05:18 hours.